A while back, while we were trying our hand at a few Cantonese dishes, we tried our hand at this one. I am not sure if this is "Cantonese" per se, but we definitely see claypot rice dishes on the menu in Cantonese restaurants. I'm guessing that it's a Southern Chinese thing. Claypot rice is another one of those "easy" dishes by which we are baffled. We just assume there are all sorts of secret techniques to which we are not privy. We just have no idea how claypots actually work. From my mother's stories, she claims to have used claypots quite frequently back in the day. 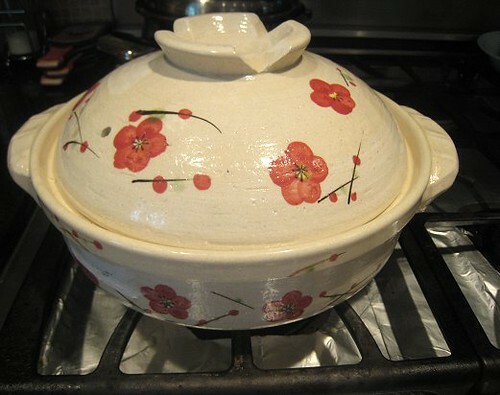 She claims that some dishes actually taste better when cooked in a claypot rather than in a metal pot. How memory goes when time flies -- when we ask our mother how to use the claypot, she seems to have forgotten how the entire process works. So, we were left to our own devices, to figure out how to use the claypot that we bought. I also have no idea if the claypot we bought was actually a good piece of equipment: being the cheapskate that I am, I of course looked for a claypot that has a "reasonable" price point. In the back of my mind, I realized that this budget-seeking impulse could lead to my downfall. But, let's not get ahead of ourselves. Time to get cookin'. First, we marinated the chicken in a little soy sauce, Shaoxing wine, sesame oil, cornstarch and minced ginger. Well, the ginger is supposed to be minced, but as you can see, we got a little lazy in the mincing department. 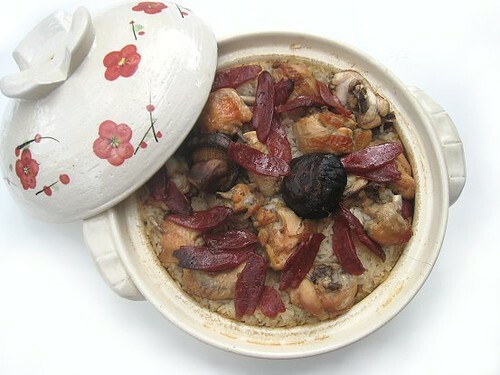 Claypot rice dishes are generally simple, so besides the chicken, we only had two other components: Chinese sausage (lap cheung) and mushroom. 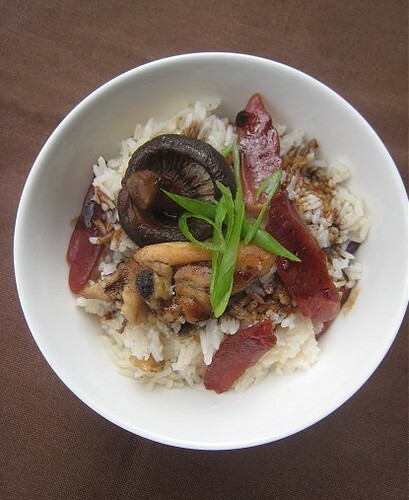 An easy "rice" dish we sometimes make is Chinese sausage rice, which involves cutting up the Chinese sausage into small pieces and putting them into the rice cooker with uncooked rice and water. 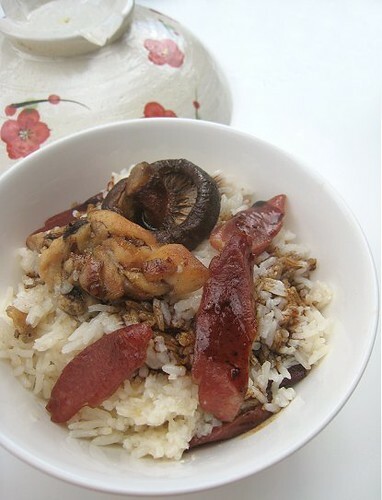 The result is delicious, with the Chinese sausage "juices" infusing the rice. 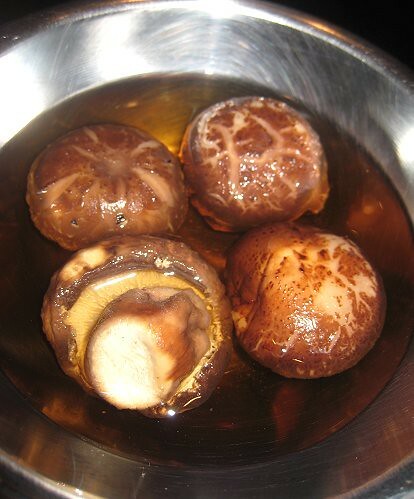 We reconstituted dried shiitake mushrooms until they were like fresh again. We also used the liquid for cooking the rice for extra mushroom flavor. There it is, the mysterious claypot. We figured we'd have to pre-cook the chicken somewhat, so we cooked them in the claypot for a little bit (not cooked all through). ...we added the rice and water into the pot. Um, I guess we should dump everything else into the pot too. In went the chicken, mushrooms and Chinese sausage. We simmered this for quite a while until the rice was cooked. 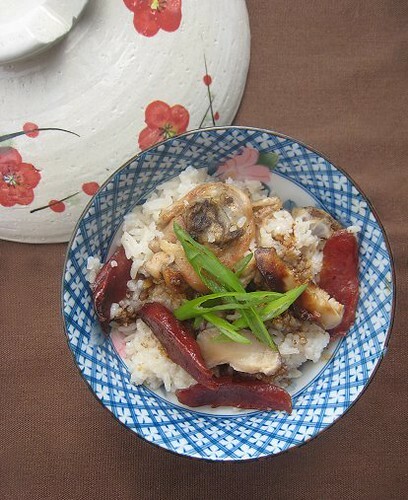 Of course, I thought, in the way lazy people think, why not just put the chicken pieces, the Chinese sausage, mushrooms in the rice cooker to cook? I guess it wouldn't be chicken CLAYPOT rice if I did that. Whoa, that claypot is getting a tad too full. Why do we always end up with a lot of food? So guess what? Since we had a lot of chicken rice to make, we did end up cooking the rest in the rice cooker! We plopped the ingredients in the rice cooker and pressed the button to "cook". Easy. Definitely not a mystery. Ah, but here's yet another one. When we order claypot rice in Cantonese restaurants, it is always accompanied by a sauce, served in a separate dish, that is then poured into the claypot. For the life of me, I have no idea what this "mystery" sauce is! It is definitely not just soy sauce! So, we tried to make something up. We started with premium dark soy sauce; it is not very salty at all, but very luxurious. It was a bit too much by itself. 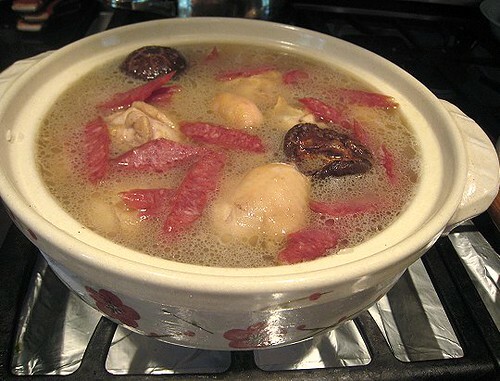 So, we added some chicken stock, then seasoned with Shaoxing wine, sugar and five-spice. This was heated on the stove for a bit. A mini disaster occurred during the making of this dish, though. We discovered a crack in our claypot while the rice was cooking! I believe we made the error of using high heat when we were "pre-cooking" our chicken. So, don't make the mistake we did. Read about how to actually use claypots before using one. I guess we just need to wait for another sale on claypots and get ourselves another one! Mini-disaster aside, our claypot rice was nice enough. The rice had turned quite brown on the bottom and on the sides of the claypot. We poured our mystery sauce over the rice and tasted the dish. But, it was still very tasty and the mystery sauce was a little reminiscent of the sauce served in the restaurants. A success, in its own way. 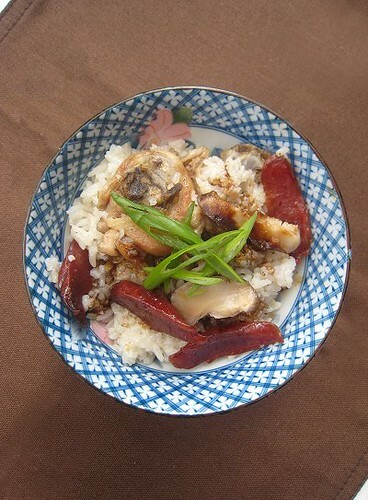 We consider this our starter claypot rice. 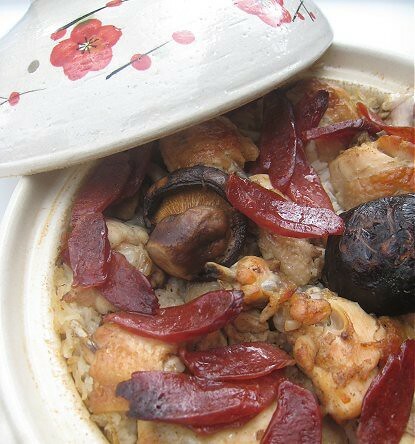 As you can imagine, the possibilities for claypot rice are endless! 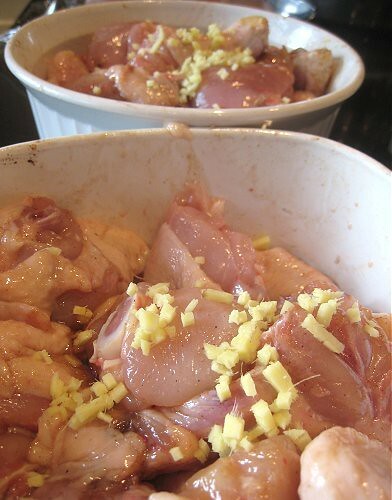 Marinate chicken in soy sauce, Shaoxing wine, sesame oil, minced ginger and cornstarch. Let sit for about 1 hour or so. 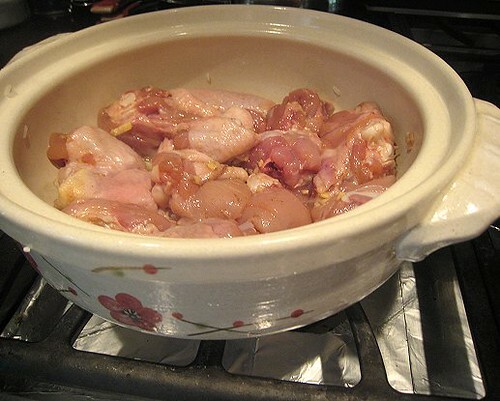 When you have about 10 minutes of marinating to go, place claypot on the stove and heat on the lowest setting. Meanwhile, slice Chinese sausages and reconstituted mushrooms. 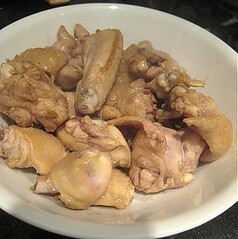 Heat oil in a wok or sauté pan over high heat, then add chicken pieces and cook until exterior turns color (no longer pink); they don't need to be browned. Set aside. Add rice to the wok and stir a few time, cooking for about 30 seconds to a minute. Add the rice and water to the claypot. Turn the heat slightly higher, to medium-low or medium. 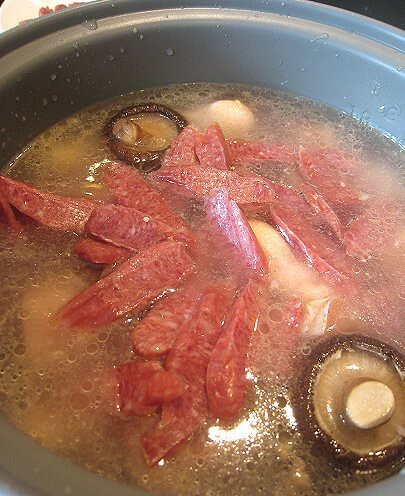 Add the chicken, sliced Chinese sausages and sliced mushrooms to the claypot as well. When the mixture starts to bubble, cover and use the lowest heat setting. Cook for about 45 minutes to an hour, checking every so often. While the rice is cooking, make the pouring sauce. Combine all the ingredients for the sauce in a small pot. Heat until barely boiling. Set aside. When the rice and chicken are cooked, turn off heat. Serve your dish in the claypot with the pouring sauce on the side. You can pour the sauce into the claypot or have each person pour the sauce into his/her individual serving. Enjoy! OK, I must admit up front that I am only good at eating but not cooking. I can't stand the heat and so I stay out of the kitchen. But if I may have your permission, I would like to add my two cents. I think you should wok fry the Chinese sausage first with oil and separately. That way it will be more "heong". The crispier you fry it the better. As for the hot pot, one way is to "rent" a hot pot from this place: http://goo.gl/7htBq ... just $3 and keep it as long as you want. LOL! Also, the rice must be cooked first and alone in the claypot until it is almost done and then turn down the heat and put in the chicken and the sausage to cook the rest of the way through. After it is cooked, take it off the stove and let it continue to cook without lifting the lid. That way it will dry it out a bit more. You want the rice to be drier and not mushy/sticky. To serve, pour soya sauce. Happy Holidays, girls, to you and your family. I've never cooked in a clay pot but this sounds delish! Happy Holidays! Merry Christmas girls and have a wonderful and prosperous New Year! TS & JS, Merry Christmas and Have a Great New Year! Wow this sounds like a serious food adventure! I've never cooked in a claypot before or even heard of one but I'd be interested in giving it a go after reading this! I see that the Chinese are not the only culture who cook in claypots! For a cheap model, I thought yours looked very nice! Thanks for the tip on keeping it on low fire, very valuable lesson. the recipe sounds good and easy, I have to try these Chinese sausages. Did you guys soak the claypot before using it? I read somewhere that because it's clay it can do that if it gets too dry. To prevent that from happening you're meant to soak it in water before use. Hope that helps. Btw, I tried you Wuxi ribs recipe and I failed =(. I think I added too much water and didn't cook it for long enough on the low heat. Must try it again! I believe this site is using one of your older posts without permission. It looks like one of those sites that make money from ads from the number of visitors. Haha, re the $3 claypot. Yeah, I'm too lazy a person for such a "high maintenance" object. Teehee. Ah, soaking the whole pot in water! The instructions merely said to FILL the claypot with water, and not for too long either. 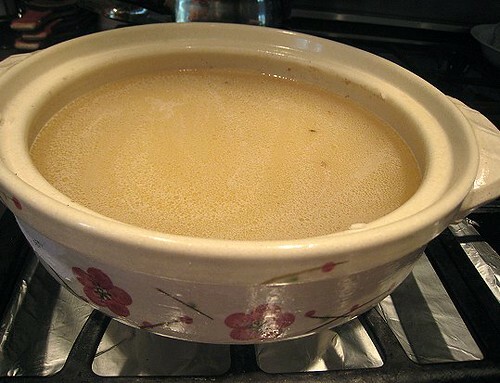 OK, we'll soak the entire pot next time, and overnight for good measure. Thanks for the tip! After reading some of the comments from this post, I just had to respond, since I've been eating this dish since childhood. I disagree with Ben from "Ben & Suanne" on the bit about frying up the Chinese sausage (臘腸). 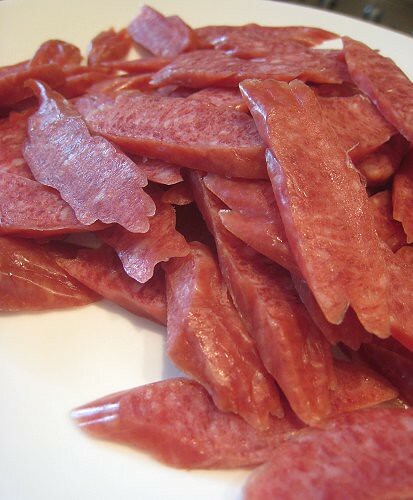 None of the places in Hong Kong or in Vancouver "fry" the Chinese sausage for 堡仔飯, it's simply just not done. 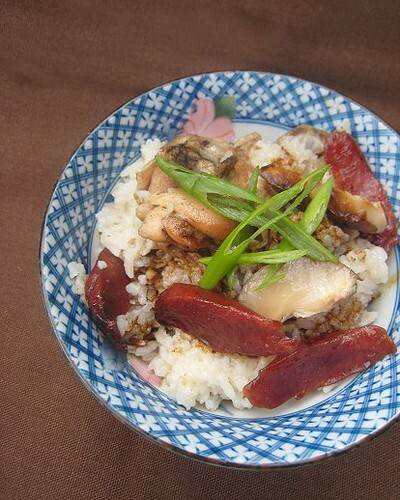 Some places may leave the Chinese sausage as a whole piece to cook over the rice, and other places may slice them up... but NEVER, ever, ever frying them beforehand. 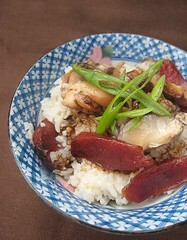 The only time one would fry up the Chinese sausage in a rice dish is for 生炒糯米飯 (sticky fried rice). If you want to stay close to the real thing, don't fry the 臘腸, that's sacrilege! 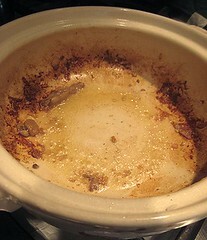 HAHA i have that same kind of situation where you said your mom used to use the claypot a lot but has now "forgotten". my grandma and great grandma used it SO much and my bak bak (freat grandma) made THEE best claypot chicken rice with the mushroom and lap cheung. but my grndma says that she forgot and it's much easier to do the rice cooker method-_-. I was trying to explain "grandmaaaa Im not asking for what's EASIER, i'm asking for AUTHENTIC!!!" she agreed to help me buy a good claypot soon so when that happens, I'll be sure to try out this recipe and use your tip to not let it crack!